Our partner agency in Germany, navos public dialogue consultants, surveyed communications professionals in more than 10 countries to identify key industry trends for 2015. The survey results show that societal, technology and government changes have changed the tool box of the communications professional. Communications strategies also adapted to the way consumers and business audiences get and consume information. In some countries, including Poland, Spain and Russia, media laws have changed and, therefore, also had an impact on the PR sector. While media relations is still a core discipline, social media marketing continues to become an integral part of communications programs. 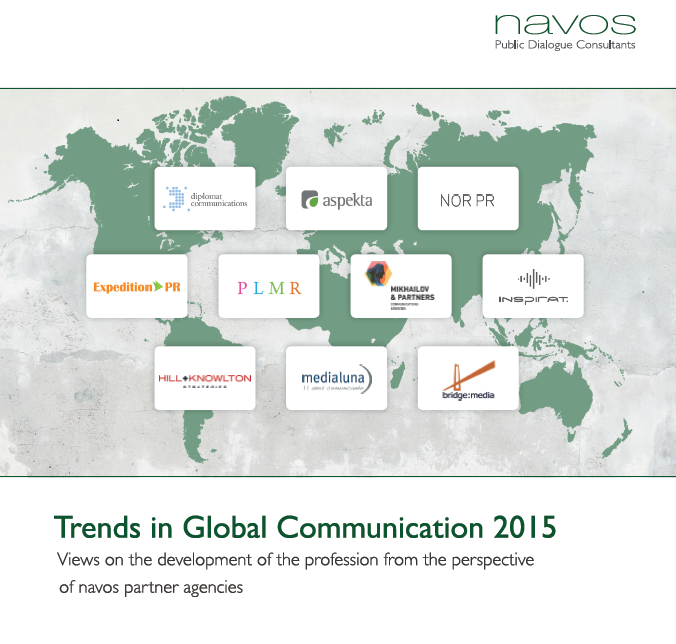 The study “Trends in Global Communications 2015″ is available for download on the navos website – http://www.navos.eu/wp-content/uploads/2014/12/141216_navos_kooperationen_pr_trends_survey.pdf.